There's something about Sundays, where even though all you want to do is veg and rest, you still want a nice Sunday breakfast (not to mention Sunday dinner). This is why I love cinnamon buns. They are comforting, they smell nice, they are ooey, gooey, sweet, and delicious. And somehow still considered an ok breakfast food. That's fine with me! But best of all, they can be prepared the day before and only take 10 minutes (ok, maybe 20 if you count preheating the oven) on Sunday morning to bake up fluffy and amazing. Cinnamon buns have three main components: the sweet dough, the filling, and the frosting. What do we have rising here? Cinnamon bun dough is a basic sweet yeast-based dough and you can use any recipe that you like. Essentially you combine dry yeast with warm milk, then add sugar, eggs, salt, fat, and flour, and knead until you get a smooth elastic dough. Then you let the dough rise in a warm place, and voila! Sweet dough. The filling is cinnamon and sugar. I like to use brown sugar because I think it gives it a nice rich flavour. You need something to make the filling stick to the dough... so you use some more fat - think softened butter or margarine - slather that onto the rolled out dough and then sprinkle the filling over evenly. The dimensions of the dough determine how big you want your cinnamon buns. If you want jumbo buns, then roll your dough out so that you end up with a thick, fat, short log when you roll it up. If you want mini buns, then roll your dough out so you get a long, skinny log when you roll it up. Or anywhere in between! This time I made 12 fairly large rolls. I don't normally like a lot of frosting on my cinnamon buns... normally I just lightly glaze with powdered sugar and milk. 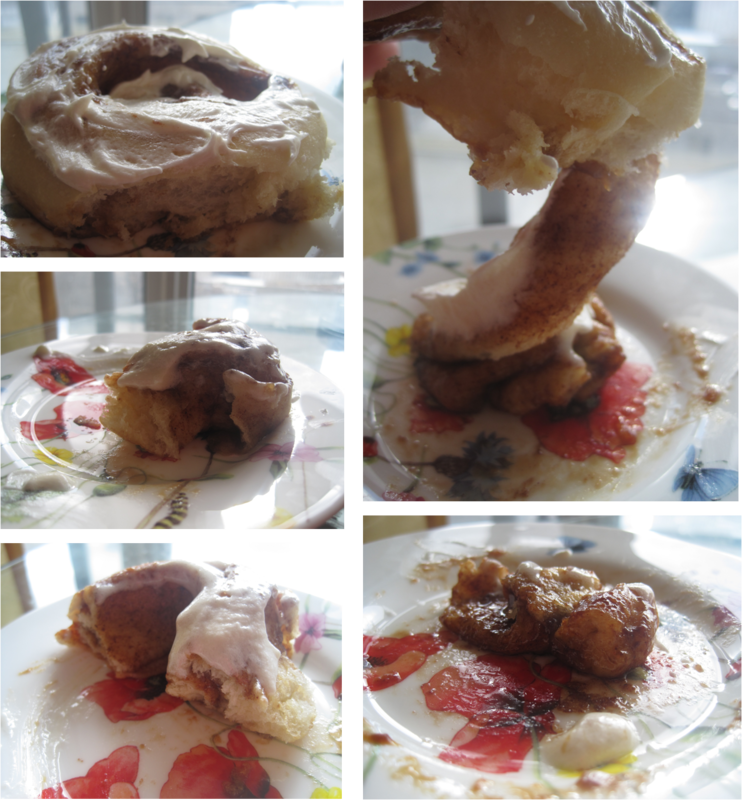 But this time I decided to try a clone Cinnabon frosting recipe from the Gordon Family. And, man, was I glad I did! This frosting is so light, not overly sweet, and melts just the right amount on the warm bun to give it that extra amazing-ness. What's also great is that you can serve the buns with the frosting on the side so that everyone can take as much as they want. Heat the milk in the microwave or in a small pot until warm. Make sure it is not hotter than 50C. Dissolve the yeast in the warm milk. Add in the other ingredients and 4 cups of the flour. Mix with a fork until it gets too thick to use the fork. Then turn out onto the counter and knead. Add in extra 1/2 cup flour as needed until the dough is smooth and elastic and not sticky. Place dough in a greased bowl and cover with a clean towel. Let rise in a warm place until about doubled in size (around 1.5 hours). Punch dough down to release air, and let rest for another 10 minutes. Roll out dough into a large rectangle. For my large buns, I made it about 16x19 inches. Slather dough with softened margarine leaving about a 1 inch margin untouched. Sprinkle filling mixture evenly over margarine. Roll dough from narrow end creating a fat log of about 16 inches in length. Cut log into 12 even rolls and place on a parchment covered baking sheet. If you don't want them to stick together, leave at least 2 inches around each bun... if you don't mind and don't want to use two baking sheets like me, then just put 'em on there however they fit. If baking the next day, cover with cling wrap and let rise in fridge overnight. The next morning, remove from fridge while oven is preheating, and then bake for 10 minutes at 400F. If your yeast seems really sluggish like mine did... just leave overnight at room temp to rise. If you don't have a stand mixer for this one (like I don't) your arm might hurt at the end... worth it? I think so! Blend cream cheese and margarine at low speed for 6 minutes. Whip at high speed for 10 minutes... I may have cheated and only done 5 minutes because I think low speed on a hand mixer is still faster than low speed in a stand mixer. Add 1 cup of powdered sugar and mix for 1 minute. Add the remaining 3/4 cup sugar and mix for another minute. Add both extracts and whip at high speed for one more minute. Alcohol free extracts are suggested for fluffiest texture, but I only had ones with alcohol... and in my opinion, the frosting was plenty fluffy. So go make some cinnamon buns and let me know how you like them! Or tell me what your favorite lazy Sunday meal is. Have a sweet start to the week!